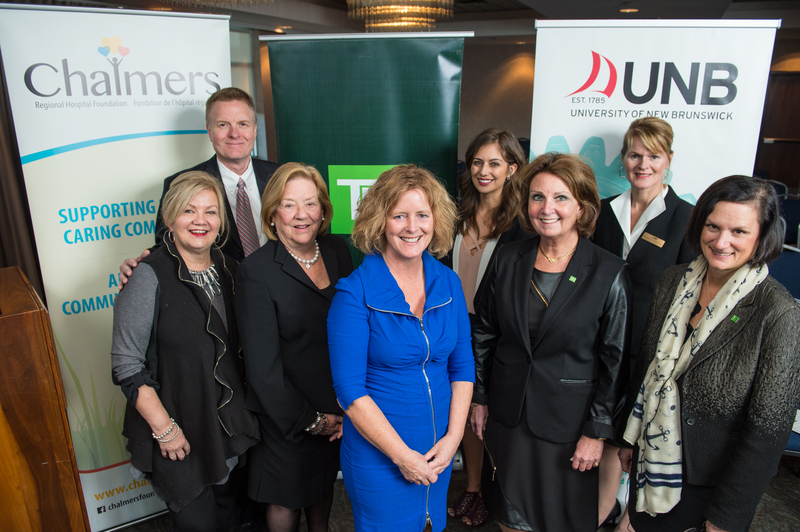 TD Wealth (TD), in partnership with the Chalmers Hospital Regional Foundation and the University of New Brunswick (UNB) recently hosted a panel discussion entitled “Time, Treasure, Talent: Canadian Women and Philanthropy” at the Wu Conference Centre on UNB’s Fredericton campus. The event was inspired by a research report commissioned by TD, entitled Time, Treasure and Talent: Canadian Women and Philanthropy. The report is the first in Canada to look specifically at the relationship between women and philanthropy. Since its publication, TD has been partnering with charities to host events across the country, facilitating engaging discussions around the topic. The evening’s discussion was lead by Mary Dingee Jacobs, TD Vice President and Investment Advisor, in Fredericton. The guest panellists included the Honourable Margaret Norrie McCain, early childhood education advocate and philanthropist; Dr. Eilish Cleary, chief medical officer of the Province of New Brunswick; Kayley Reed, co-founder, Wear Your Label and UNB alumna; and Jo-Anne Ryan, vice president, philanthropy, TD Wealth. The report found that women donated approximately $3 billion to charitable organizations in 2012, making a tangible impact on the world around them. The panelists were all eager to convey that philanthropy is comprised of much more than monetary donations and the act of giving to a cause through one's “time and talent” became a poignant theme of the evening’s discussion. Kayley Reed continued the sentiment, remembering what it's like to be a student who may not have monetary gifts to share, but instead can give of their talents. “I think that one of the greatest talents that our young people can bring to these organizations is your knowledge of the Internet and social media,” said Reed who helped non-profits manage their online presence through internships that were part of her program at UNB. The evening concluded with a question and answer period and a reception.